just found your blog thanks to multiples and more! and WHAT A CUTE PUPPY! oh my goodness! so glad that the kids are having a blast with her! 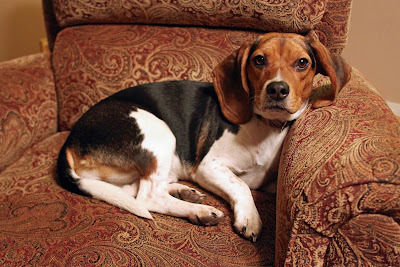 I almost adopted a beagle a couple of years back, but I missed my chance. Daisy is adorable! I'm glad she and your kids get along! She's so pretty! I love your name choice, but Daisy is cute too. It suits her. We got a new puppy too! I have not posted about her yet. Tune in for pics real soon. I got my big yellow lab the same way. They swore she was good as gold. LIARS! But after 12 years, I wouldn't trade her for another dog. Even with all her "quirks" she is my baby and I love her. Your puppy is totally cute and makes me want another doggie. My husband would kill me if I brought home another kid or animal, so I guess I'll just admire yours. oh she is lovely, we had a beagle for over 12 years , very naughty and greedy he was, had to pick him up at the local police station many times for disappearing after a scent, however he was as good as gold in the house and very gentle around our babies, fantastic dogs for children.